More infos on "Country Strong" Official site! 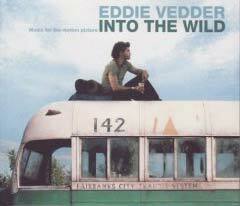 "Into the Wild" is the first solo album from Pearl Jam's Eddie Vedder based on his contributions to the soundtrack for the film of the same name. Director Sean Penn hand-picked Vedder to provide the music for the film. In the film's credits, Michael Brook is actually acknowledged for composing the film's original music (Vedder is primarily responsible for the songs in the film.) Vedder's cover of the song "Hard Sun" (originally written by Gordon Peterson who performed under the name of Indio on the album Big Harvest) features backing vocals by Corin Tucker of Sleater-Kinney and appears in the film, along with a slew of other folky ballads. Vedder collaborates with Jerry Hannan on the song "Society", written by Hannan. The soundtrack debuted at number 11 on the U.S. Billboard 200 chart, selling about 39,000 copies in its first week. As of early January, the album has sold 219,603 copies. Vedder won a 2008 Golden Globe for the song "Guaranteed" from Into the Wild. He was also nominated for a Golden Globe for his contributions to the film's original score. "Guaranteed" was also nominated for a 2008 Grammy Award in the category of Best Song Written for a Motion Picture, Television or Other Visual Media. Crosby, Stills, Nash & Young's "CSNY/Déjà Vu" film will premiere at the Sundance Film Festival in Utah in late January. The film is directed by Bernard Shakey and produced by L.A. Johnson. 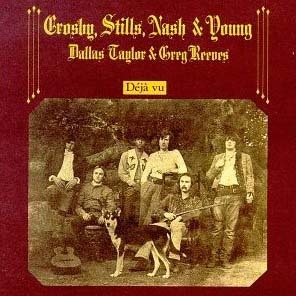 "CSNY/Déjà Vu" features 1996 Crosby, Stills, Nash & Young tour and is about Neil Young album "Living With War", a LP clearly against US President George W. Bush. Crosby, Stills, Nash & Young's "CSNY/Déjà Vu" film features a documentary part (Vietnam war...) and also the performances of the band. Although the chronicle of that tour, "CSNY Déjà Vu" film, is indeed a look back at the politics and anti–Vietnam War sentiment, its real value lies in its rejection of simple nostalgia and its ability to focus on the present day. As both a portrait of a band and an examination of artistic process, "CSNY Déjà Vu" is filmmaking that is self-centered, yet fresh and critical. Featuring music from Neil Young’s controversial "Living with War" CD, this evocative and edgy film documents reactions from fans to a band that has remained committed to issues of politics and art for more than four decades. 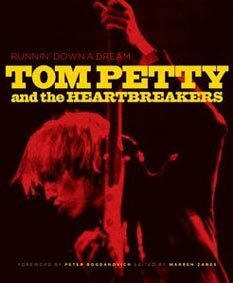 Tom Petty And The Heartbreakers Film "Runnin' Down A Dream" and DVD and CD released! Let's imagine a documentary about Tom Petty and The Heartbreakers... That's now a reality with "Runnin' Down A Dream", a film by Peter Bogdanovich. On April Fool's Day 1974, Tom Petty hopped into a van with his bandmates, including future Heartbreakers Mike Campbell and Benmont Tench, to pursue dreams of rock and roll stardom. Ten Miles outside of town the van broke down. And the world paid no mind. But the cameras were already running. That moment in Heartbreaker history and many others were caught on film well before Tom Petty was a household name. Still an unknown outside of his home region, Petty was fronting the band Mudcrutch, which would only gradually evolve into the Heartbreakers. The music itself was the only sure sign of what was to come. These remarkable early years, and all that would follow, are at the center of a new documentary by legendary director Peter Bogdanovich ("The Last Picture Show"). "Runnin' Down A Dream" includes performances from the 30th anniversary concert at the O'Connell Center on September 22nd, 2006, rare television footage, never before seen interviews from the archive, clips from Bogdanovich's discussions with such Heartbreaker friends and family including Eddie Vedder, Stevie Nicks, Rick Rubin, Jeff Lynne, and many more musicians, friends and collaborators who came into the band's orbit over the years. "Runnin' Down A Dream" focuses not only on the Heartbreakers' inspiring ride to the top but the story of what they did when they got there, as artists, as a band and as people. Bogdanovich's film explores many of the underlying reasons for the band's unmatched capacity not only to endure but to thrive. Gritty, exuberant, infectious: "Runnin' Down A Dream" tells the Heartbreakers' story as never before, revealing the combination of unwavering talent, artistic vision, and sheer persistence that has made their thirty-plus-year run possible. Peter Bogdanovich has earned a reputation as one of American cinema's great filmmakers. In addition to his work as a director, Bogdanovich has received acclaim as an author, a critic, a screenwriter, a documentarian, an actor, and a historian. His films, including "The Last Picture Show," "Paper Moon," and "Mask," have been Oscar-winning landmarks. "The Last Picture Show" is a National Treasure as declared by the Library of Congress. Viewers know him for his recurring role and directing work on "The Sopranos." Film historians and movie buffs alike know him for his monographs on Orson Welles, Alfred Hitchcock, and John Ford. On the heels of "Runnin' Down A Dream," Bogdanovich will return to feature film directing with a new film entitled "Star-Crossed," based on a true Hollywood love story. He's also planning a return to the theater to do a Broadway production of Tennessee Williams's last play, "In Masks Outrageous and Austere," which is being co-presented by Gore Vidal. On October 16, a special 4-disc box set of the film will be released for sale only at Best Buy. At the heart of the package is the 2-DVD, 4 hour Bogdanovich film. As a bonus the package also includes a DVD of the celebrated 2006 Tom Petty and the Heartbreakers 30th Anniversary Concert in Heartbreaker hometown, Gainesville, FL. The package also includes a soundtrack CD of rarities and previously unreleased tracks from the film. This movie (on the DVD) contains hours of never before seen footage and interviews with Tom Petty and the Heartbreakers plus music from the storied rock band's entire career. The movie features interviews with George Harrison, Eddie Vedder, Stevie Nicks, Dave Grohl, Jeff Lynne, Rick Rubin, Johnny Depp, Jackson Browne and more. Also 1 DVD of the celebrated 30th Anniversary Concert in Heartbreaker hometown, Gainesville Florida. Grand Champion soundtrack feat. Willie Nelson, George Strait, Robert Earl Keen, Grand Champion soundtrack now on sale (on Hannover House). Two of the biggest stars in Country music headline the debut soundtrack CD from Hannover House, "Grand Champion," now on sale at Wal-Mart and other key music retailers. Multi-platinum recording artists George Strait and Willie Nelson have each contributed new cuts to the soundtrack CD for the recently released family movie of the same name. Other notable artists on the 15-track CD include Charlie Robison, Robert Earl Keen, Asleep at the Wheel, Brian Burns and Eliza Gylkyson. "We are excited and honored to be handling this prestigious soundtrack," said Hannover House President, Eric Parkinson. "The artists appearing on this CD have collectively sold over 100-million albums, and these tracks are some of their best works. 'Grand Champion' is hands-down one of the best country soundtracks of all time," he concluded. "Grand Champion" is an award winning family feature from director Barry Tubb, son of the legendary musician, Ernest Tubb. Cast members for the film include notable appearances by superstars Julia Roberts and Bruce Willis, along with country music stars George Strait, Charlie Robison, Robert Earl Keen and Natalie Maines of "The Dixie Chicks." The principal stars in the film are Joey Lauren Adams ("Big Daddy") and Emma Roberts (Nickelodeon's "Unfabulous"). The film tells the story of a young boy and his prize winning heifer in livestock competition in Texas. Critics have praised the G-rated film for it's positive themes, comedy and adventure, while music fans have noted the film's stellar soundtrack. 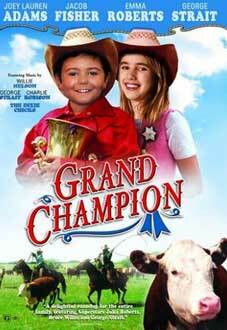 "Grand Champion" was released to theaters last September, and to home video in January. The film's soundtrack was not originally slated for commercial release until Hannover House was flooded with consumer requests. "We received thousands of calls and letters about the soundtrack," said Parkinson. "When you see the movie, it's clear how important the music is to establishing the film's upbeat mood and pacing. It's a toe-tapping collection that is contagious and extremely repeatable. We think that this will be a very popular CD for a very broad audience." Hannover House reports that several key radio stations have agreed to add the singles from George Strait and Willie Nelson in July. "Big Balls In Cowtown" features George Strait on vocals, and is backed-up by Asleep at the Wheel. "Born In A Barn" is classic Willie Nelson at his best in an all-new and exclusive track. Grand Champion soundtrack CD feat. Willie Nelson, George Strait, etc. : ORDER IT NOW . music, willie nelson, george strait, country music. Narnia Soundtrack feat. Steven Curtis Chapman, Jars Of Clay, Rebecca St. James, Narnia Soundtrack due September 27, 2005 (on Sparrow Records). EMI CMG, in partnership with Walt Disney Studios and Walden Media, will release "Music Inspired By: The Chronicles Of Narnia: The Lion, The Witch and The Wadrobe" to stores nationwide September 27, 2005, featuring new songs from today's top Christian artists. The inspirational project is the first of two major soundtracks sparked by the most anticipated film of 2005, a live action adaptation of the best-selling C. S. Lewis classic, "The Chronicles of Narnia: The Lion, the Witch, and the Wardrobe". Five-time Grammy Award winner Steven Curtis Chapman performs the first "Narnia" single and video, "Remembering You," which goes to Christian radio stations August 5. Other artists who contribute new recordings to the first set include Jars of Clay ("Waiting For The World To Fall), Jeremy Camp ("Open Your Eyes"), tobyMac, Nichole Nordeman ("I Will Believe"), Rebecca St. James ("Lion"), Bethany Dillon ("Hero"), Delirious ("Stronger"), Kutless, Chris Tomlin ("You're The One"), and David Crowder Band. The second "Narnia" soundtrack, featuring mainstream pop and rock artists, is scheduled to release October 25 through EMI CMG. Details are forthcoming. Regarding his participation, Steven Curtis Chapman said, "So much has already been brilliantly communicated by C. S. Lewis with this story, so writing for it was an overwhelming task. This story leaves me wanting to remember what it means to experience spring or new life. 'Remembering You' is a song from the perspective of a lot of the characters at the end of the story, saying, 'Whenever I see the first signs of spring, I'll be remembering you, Aslan, the story and what is to come.'" Promotion of the soundtracks is already under way, in association with movie's advance trailer being shown at major Christian music festivals around the United States this summer. Bethany Dillon was also on hand to perform her new song from the inspirational soundtrack in New York this month at an American Booksellers Association event. Currently in development, NarniaMusic.com will feature artist interviews, song samples, promotions, and more. 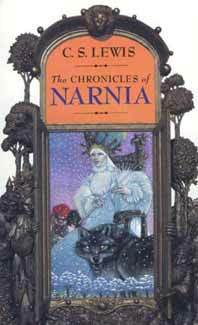 vThe Lion, the Witch and the Wardrobe was first published in 1950 and is the second and best-known novel in the seven-part Chronicles of Narnia series written by C. S. Lewis. Published in 29 languages, the allegorical series about the life of Jesus Christ has sold over 85 million books to date. Steven Curtis Chapman "All Things New" new CD: ORDER IT NOW . Diary Of A Mad Black Woman Soundtrack, Diary Of A Mad Black Woman Original Motion Picture now out. Rowdy Entertainment, in a joint venture with Universal Motown Records, is releasing one of the year's most talked-about soundtracks, the accompanying disc to this year's breakthrough movie, Tyler Perry's "Diary of a Mad Black Woman". The uplifting compilation is co-produced by Tyler Perry and acclaimed producer Dallas Austin, and hit stores April 19. One of the first lead singles from the soundtrack is the soulful and upbeat track, "Purify Me" by the award winning artist, India.Arie. The music video for the song was recently shot in Los Angeles and featured a cameo by the movie's lead actress, Kimberly Elyse. The other lead single is "Things I Collected" by the sultry R&B singer Tamia. This 12-song CD is a veritable "divas delight" and includes some of the most talented female artists in the industry. The soundtrack features a mesmerizing blend of unforgettable ballads; from Heather Headley's "Ain't It Funny" and Monica's "Sick and Tired," to Natalie Cole's evocative and tender "I Wanna Love Again". Cheryl "Pepsi" Riley does a stellar remake of Joan Osborne's 1995 hit "One of Us". The legendary Patti Labelle delivers another one of her classic performances on "I Wanna Be Free". One of the many spiritual highlights of the album is Tamela Mann's sanctified Gospel track, "Take It To Jesus" and the poignant "Father Can You Hear Me" by Terrell Carter and Tamela. Writer/producer African-American playwright Tyler Perry was the key motivating and creative force behind the conception of the soundtrack, contributing his writing talents on six of the twelve songs. The collaboration between Tyler Perry and Dallas Austin came about after a mutual friend introduced them at an Atlanta gathering. The film was already slated for release when Perry and Austin began their creative collaboration. The duo's diverse track records in their respective arts was enough to attract interest from acclaimed artists such as Labelle, Cole, and Arie. Tyler Perry's "Diary of a Mad Black Woman" was the #1 movie at box offices across the country in its opening week this past month, garnering an estimated $22 million in weekend ticket sales. "Diary Of A Mad Black Woman" Soundtrack new CD: ORDER IT NOW. "Rock School" soundtrack, "Rock School" original motion picture avilable May 31, 2005 through Trillion Records. The soundtrack to the much-anticipated film 'Rock School' will be released on May 31, 2005 through Trillion Records. The documentary, which will hit theaters early this summer through NewMarket Films, chronicles the inception and success of Paul Green's School Of Rock Music, which was founded in Philadelphia in 1999 to teach young musicians and singers to play and perform classic rock 'n' roll. Produced by Grammy Award-winning Phil Nicolo (Lauryn Hill, The Roots, Train), the soundtrack to Rock School takes a unique approach by featuring the actual students that appeared in the film re-recording hits alongside legends like Alice Cooper, Deep Purple's Ian Gillan, Yes' Jon Anderson, The Police's Stewart Copeland, The Ramones' Marky Ramone, Heart's Ann Wilson, Megadeth's Dave Mustaine, and Billy Idol. "When the producers asked me to be a part of Rock School, I said okay and asked them to send me a track of the kids performing our song. What I heard was a bunch of kids giving it 100%, and it sounded great. It was good fun," said Ian Gillan of Deep Purple who performs the band's hit "Highway Star" on the soundtrack. "Rock School" is the soundtrack to more than just a temporary fantasy camp. It's the beginning of the kids' new way of life. 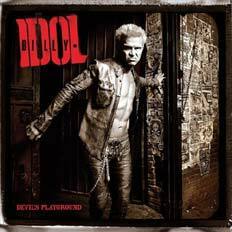 Billy Idol "Devil's Playground" new CD: ORDER IT NOW. "Robots" Soundtrack, Robots soundtrack feat. Earth,Wind & Fire and James Brown. The soundtrack for the 20th Century Fox Film "Robots" was recently released on Virgin Records. "Robots" is a major new animated film created by the Academy Award-winning director that brought the Oscar-nominated Ice Age to the screen. The film opens nationally March 11, and will be released by 20th Century Fox in both IMAX and standard versions. 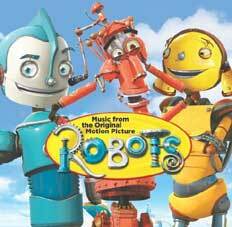 "Robots" features the voices of stars Ewan McGregor, Halle Berry, Robin Williams, Mel Brooks, Greg Kinnear, Drew Carey and Jamie Kennedy. "The Robots soundtrack is a wonderful souvenir of the film," said Robert Kraft, President, Fox Music. "We are lucky to have superstars like Earth,Wind & Fire and James Brown on the same record as fresh new acts like Ricky Fante and Fountains of Wayne." The soundtrack features an exciting new song from R&B supergroup Earth, Wind & Fire, called "Love's Dance," collaboration with superstar producers Jimmy Jam and Terry Lewis, from a forthcoming new EWF album. Also contributing original tracks for the soundtrack are Virgin Records soul star Ricky Fante, with "Shine," and Fountains of Wayne with "Tell Me What You Already Did." Film score composer John Powell is joined by theatrical innovators Blue Man Group for "Robot City." Several recent hit tunes in the soundtrack will be familiar: "Right Thurr," the hip-hop smash by Chingy; the top 20 single "I Like That" by Houston, featuring Chingy and Nate Dogg; and the recent single by Stacie Orrico, "(There's Gotta Be) More to Life." New Zealand pop-punkers Steriogram also highlight the soundtrack with the manic "Walkie Talkie Man," nominated for a Breakthrough Video in last fall's MTV Video Music Awards, alongside Fatboy Slim's "Wonderful Night," the latest single from his album Palookaville, featuring a rap by Lateef the Truth Speaker. Mercury Music Prize winners Gomez, currently touring the U.S., contribute the song "Silence." Pop music's legends are also represented in the track list, with War's west coast Latin-funk classic "Low Rider," while James Brown's late-Seventies "Get Up Offa That Thing" appears in a new club remix. "Robots Soundtrack" new CD: ORDER IT NOW.